You know how important it is to keep your kids healthy. 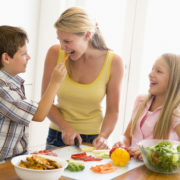 Making sure that they maintain a well-balanced and nutritious diet has become one of your main priorities. But going in the kitchen at least five times a day and spending hours cooking and preparing meals for the kiddos can be exhausting. And let’s face it, they’re probably getting tired of the same old ham and cheese sandwiches. Have no fear, though – Cranium is here to help you! Here’s a list of fast and healthy snacks and lunches that will cut back on your time in the kitchen and facilitate the process of coming up with nutritious meals for your children. In order for children to develop properly, it is just as important for us to focus on their physical growth as it is to focus on their mental and emotional growth. At Cranium Academy we emphasize nutrition because we know that the mind feeds off the body. Physical well-being has always been one of our focuses here at Cranium, which is why we offer a unique physical education approach that integrates cognitive learning as part of our curriculum. We encourage physical activity along with a nutritious diet in order to keep a balanced and healthy lifestyle that promotes your child’s development.